Well the tech race is speedy just like you play NFS and Speedway, this era is as fast pace as a gameplay, unless you quit yourself it never stops. You see, there is always a big news of a new phone launching, and people get overexcited to pre-book/preorder the smartphone before the stock runs out. As Nokia has not been up to manufacturing new sets, its new launch of Nokia 8 became talk of the town, the sets are available surely in the month of September, but let us first take a quick glimpse of the turn-Ons and turn offs. The best thing about Nokia 8 which I found notable is its crisp camera; that gives a swift and shaper experience with its 13MP front-facing and rear camera (13MP+13 MP dual-lens). The size of the display is 5.3 (quite a bigger phone than expected), also it has a very fine and clean body available in shiny and matte types, whatever suits you, it is a slimmer and quite a modern phone offering 4Gb ram, the turn off is that it is a bit showerproof but not fully waterproof, so take it aside if you have plans for a pool party, it has 64GB of storage with 256 micro-SD support well wait, WHOA! Something real big, yeah! I am sure it is going to be a big YOW for quite some time, and we too were looking for a phone which is not very expensive but having all the salient and up to the mark features that we have sought after. 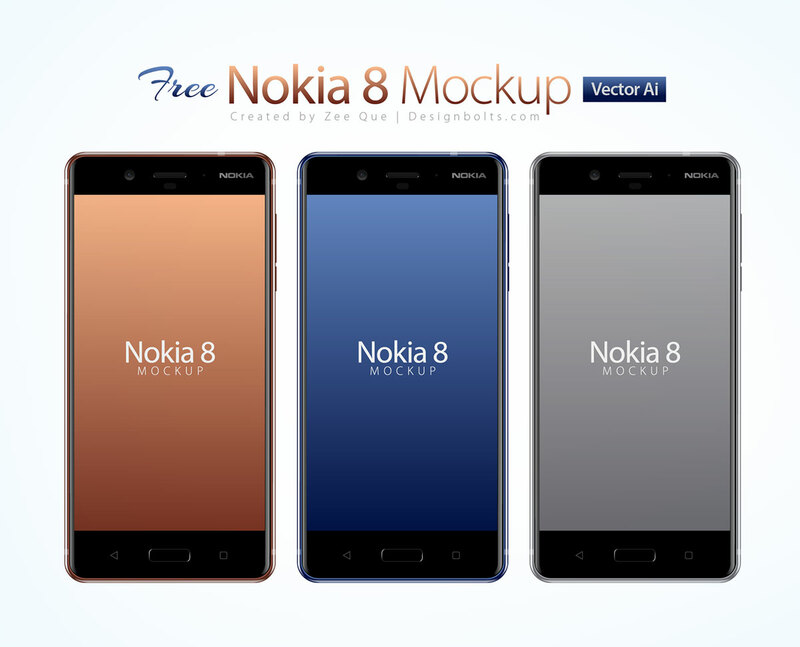 Down here I am putting forward a free Nokia 8 smartphone Vector mockup that you can use for your presentation for your clients. Insert in the design elements or place it on your tech blogs for the better understanding of its features etc. or for the task/app you want to present before viewers/clients. For more tech posts and other design feed, don’t forget to subscribe to us, we are here to provide you with quality content, and classy design dose. Here we go!